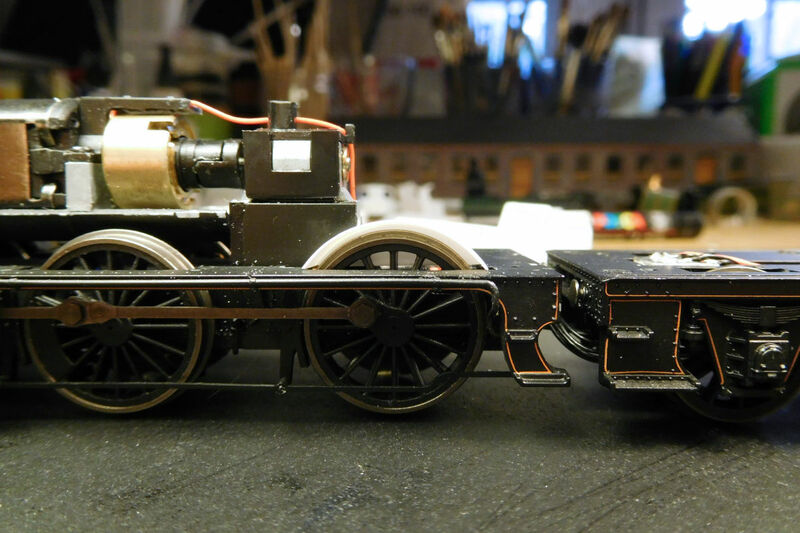 Here’s a summary of the work so far on my attempt to backdate the Oxford Rail Dean Goods to 1900s condition. Thanks to everyone who has helped with advice and information. My model is based on a 1903 photo of No. 2487, sporting the S4 roundtopped boiler and wide footplate. 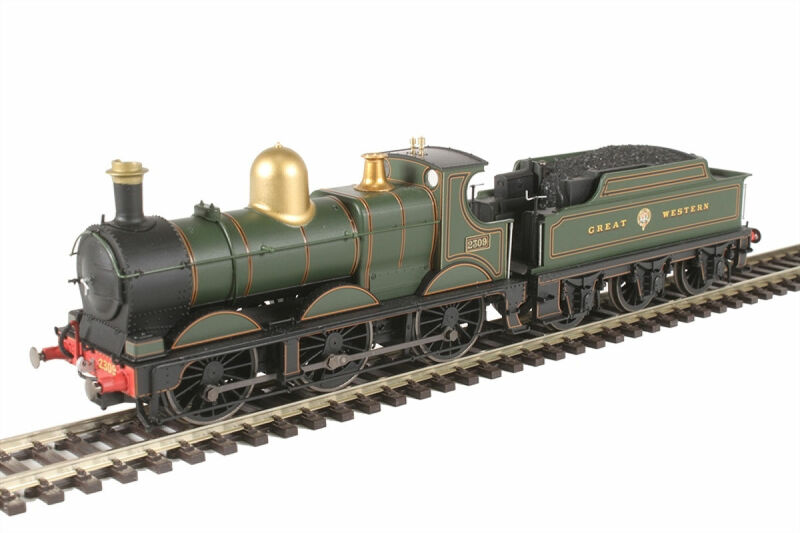 Various features such as a short smokebox, large cab spectacles and "piano lid" cylinder cover will make it a bit different from the superb Finney kit models out there - no other comparison intended! Above is the starting point, the Oxford Rail Dean Goods. This is the original release, before certain improvements were made to the body. 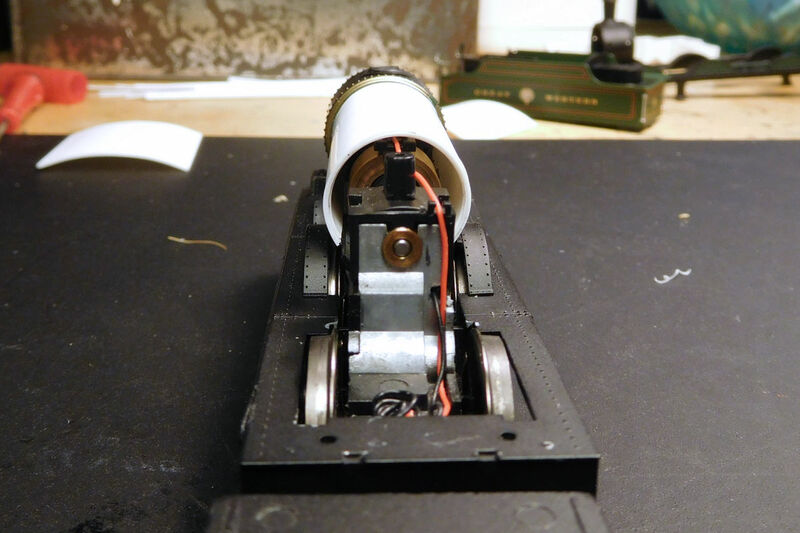 The model comes with plain con rods and wide footplate. 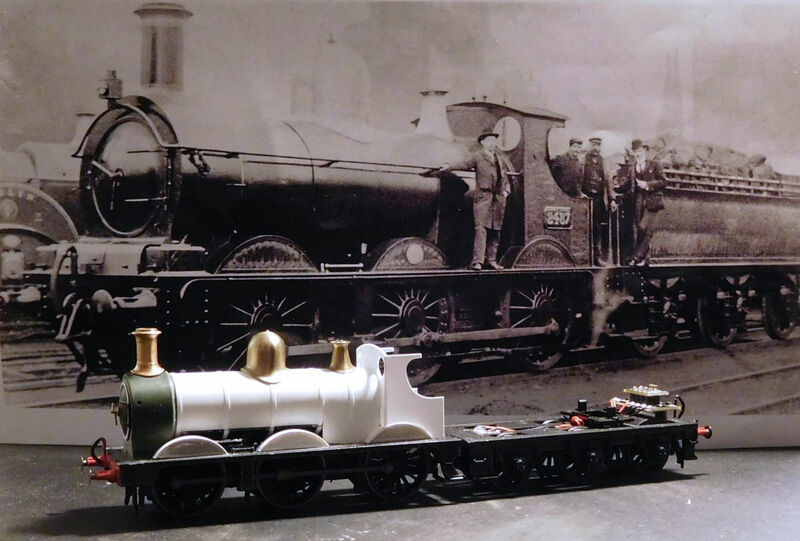 This particular combination was found on Lot 99 and 100 (nos 2451-2490), so is appropriate for my loco. Incidentally, some locos built with fluted rods later acquired plain ones, meaning that selected locos in the 2491-2580 wide footplate series could also be made. The chassis is a good silent runner. The cast footplate is also good in my view, so was retained. However the splashers and cab were discarded. The splashers are rather thin and high, and the cab is too tall for a roundtopped version. 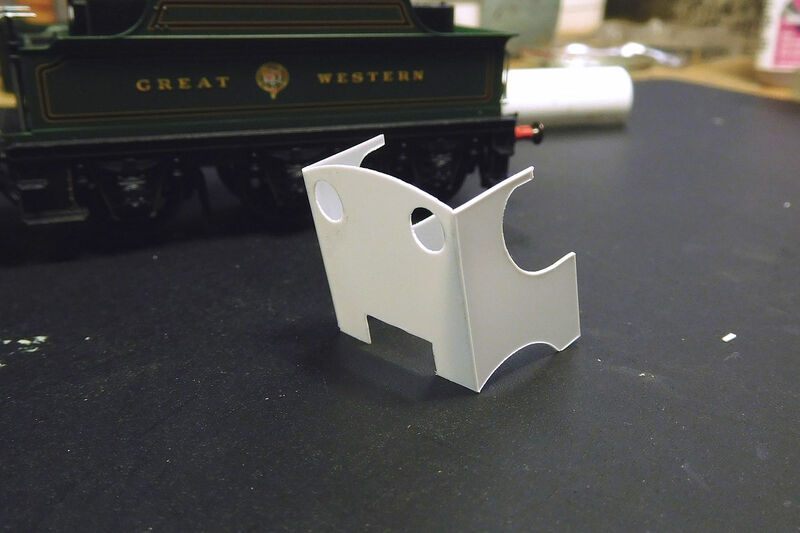 I might have accepted this on other occasions, but I wanted to see what I could do with styrene and a Silhouette cutter. 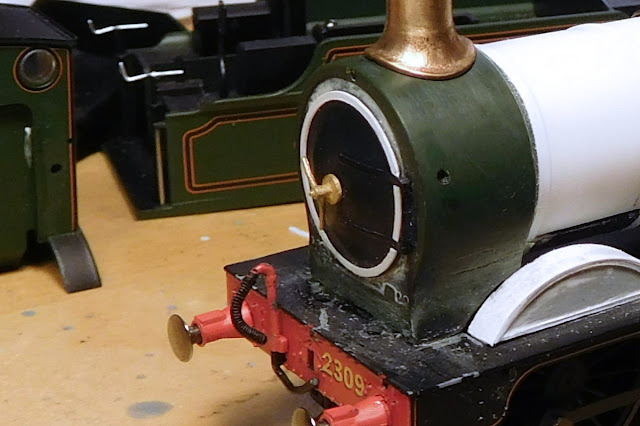 The Belpaire firebox also had to go, and as the boiler then becomes too short for a roundtopped version, I discarded that too. 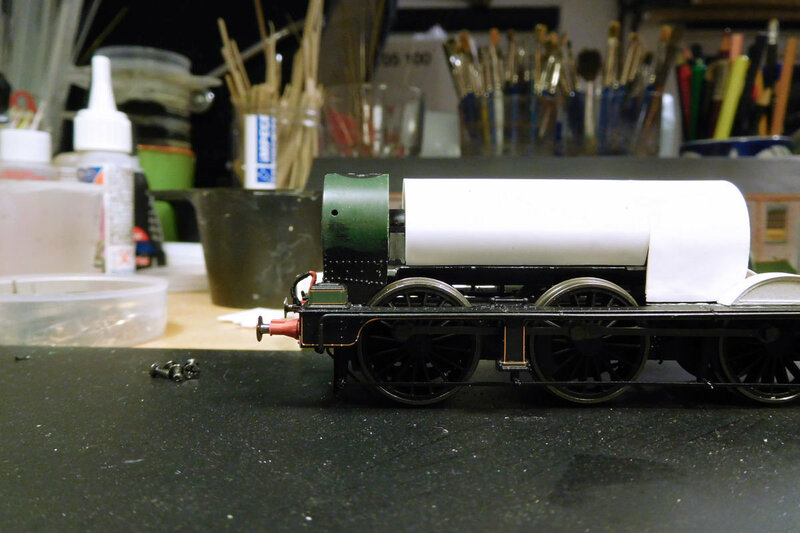 The smokebox was sawn off and put aside for later modification. 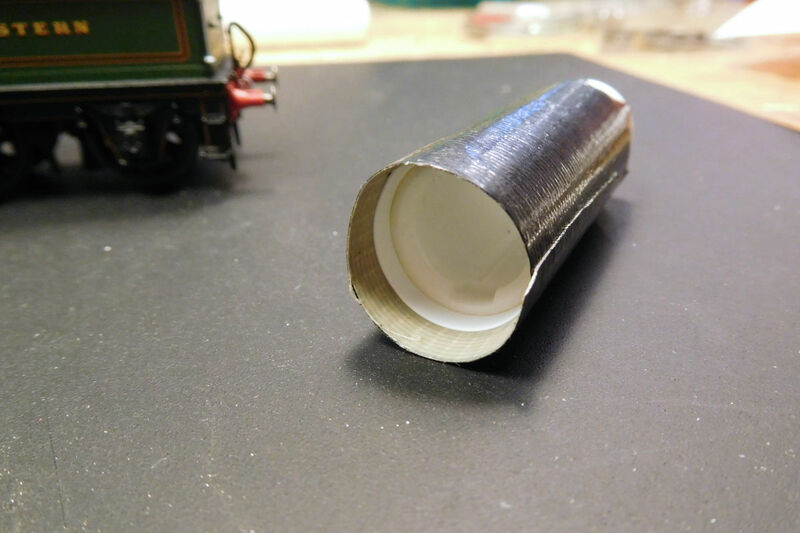 I made a new boiler from laminated layers of 5mm styrene. Each layer was shaped by wrapping it around a former, taping it with duct tape, and dunking it in boiled water. I used a Lypsyl lip balm container as former, and stuck the duct tape to the workbench a couple of tiems to reduce strength. Next time I will probably use a single thicker sheet for the boiler, as I’m a little worried about possible expansion over time. So far however it has proven stable. 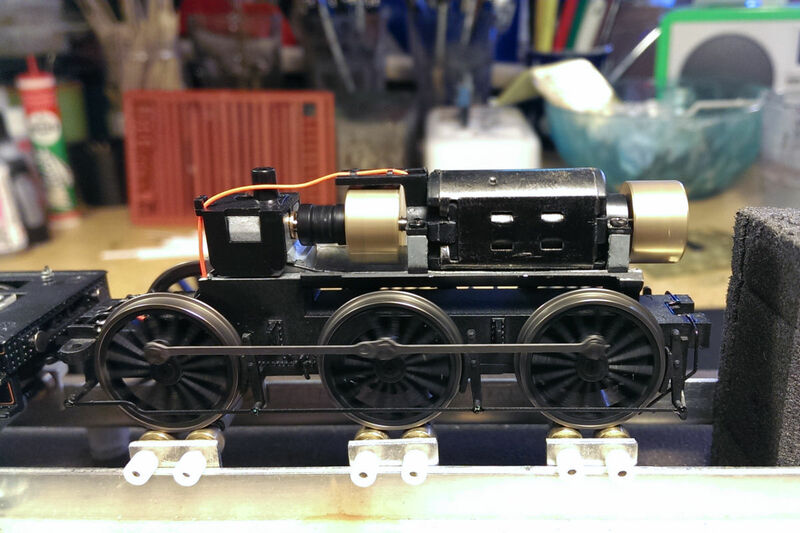 This is the boiler test-fitted on the Oxford footplate and chassis. The Oxford chassis has a cast section representing the underside of the boiler. My boiler had to fit this, while still allowing the body to be detached if necessary. This is the most problematic part of the project. To make things easier, I built the boiler separately from the firebox. The cast underside of the boiler can be seen here. The join looks poor in this shot, as the boiler and firebox were still loose. The firebox was shaped as per the boiler, with a wood former for the sides. 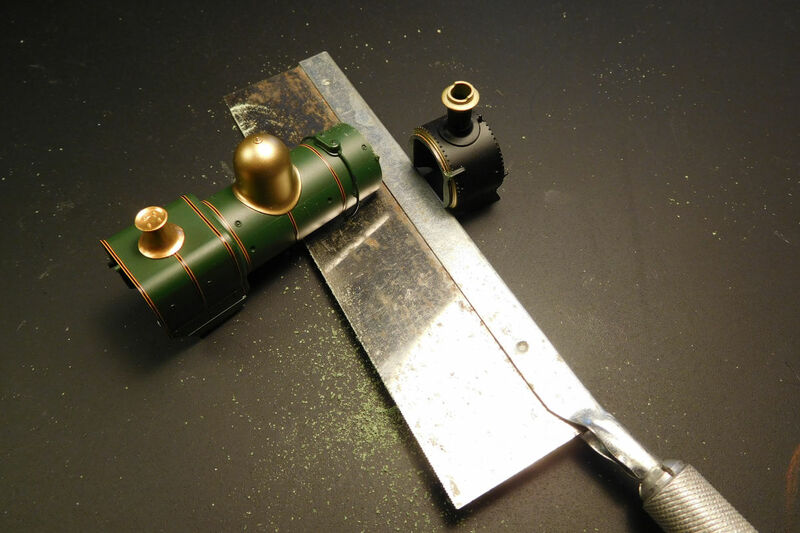 The smokebox is seen with the chimney cut off, rivets and other bits filed away, and the length shortened with a saw. 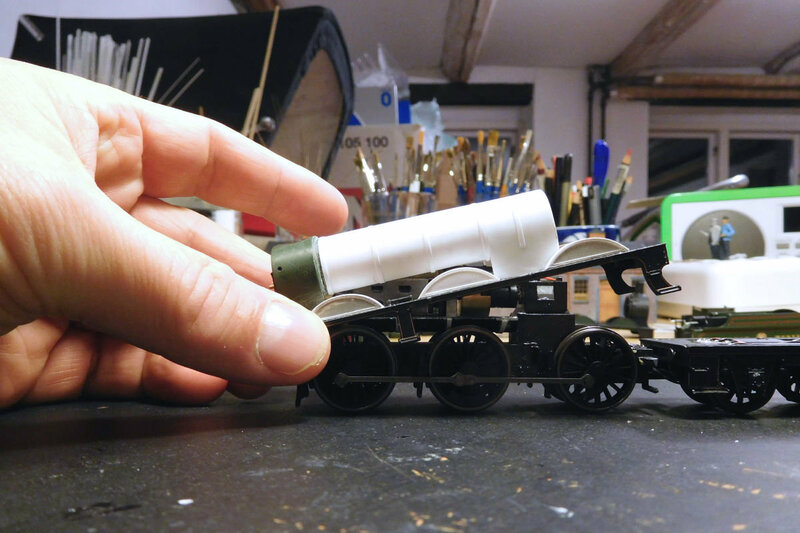 For reasons I have now forgotten (must be all those designer drugs), I chose to shorten the smokebox from the rear. The smokebox pushed back to meet the boiler. 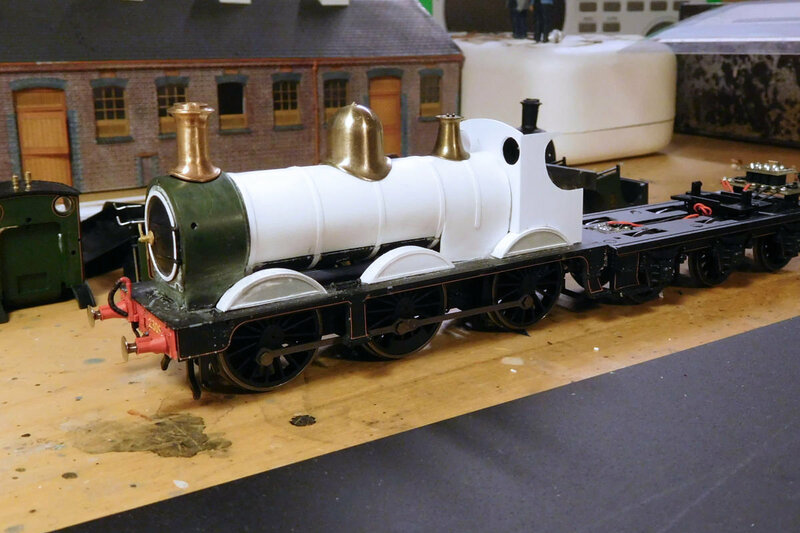 The elegant transition between smokebox and boiler on the prototypes was not easy to get right. I did my best using a slice of the original Oxford smokebox, and a ring of brass wire. The leading boiler band (overlaid here with lining) helps too. 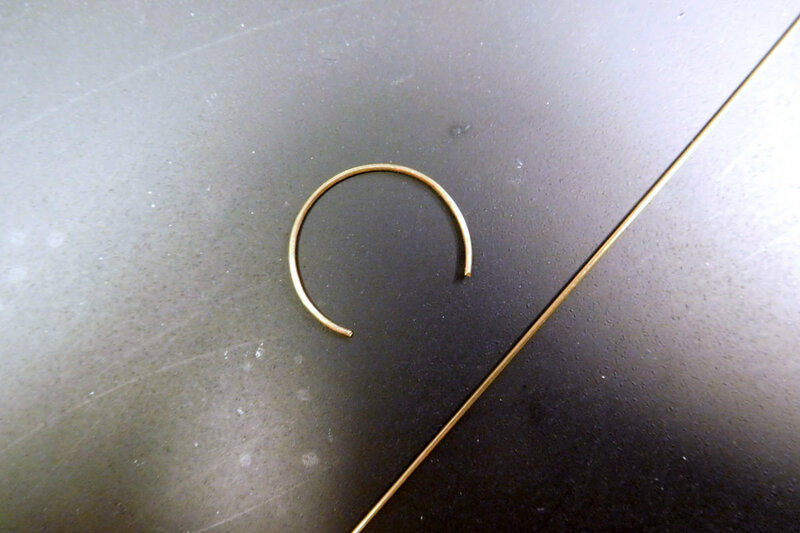 The brass ring imitates the, um, brassy ring that can be seen on prototypes in the 1900s. It is a snap-fit, and won’t be finally stuck down until after the body has been painted. 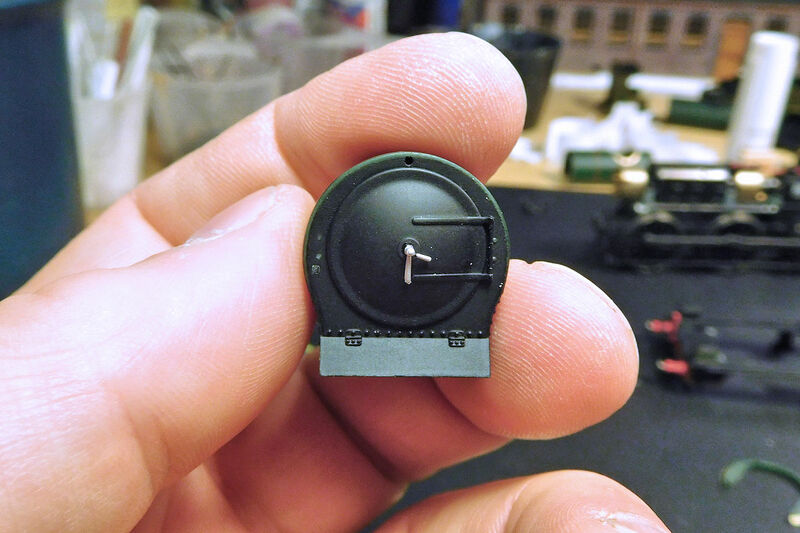 The smokebox door also needed work. Here’s how it originally looked. I added an outer ring to the smokebox door, and a new door dart. 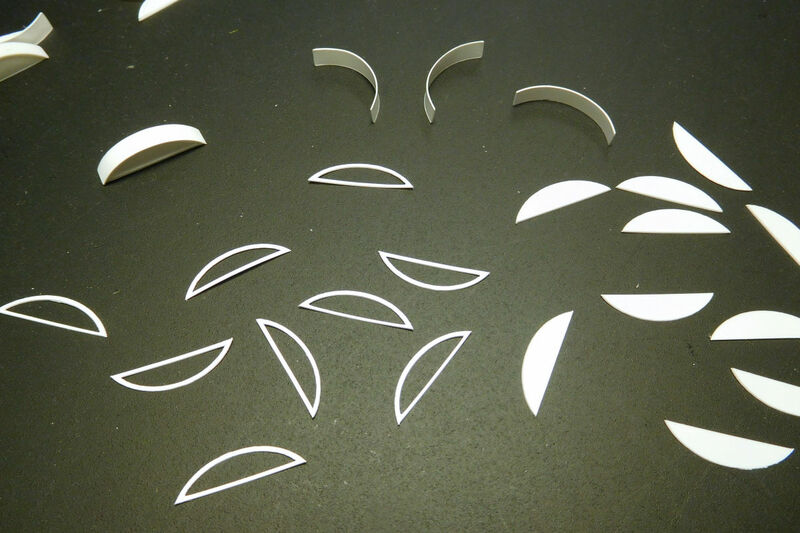 The ring was cut on my Silhouette cutter. 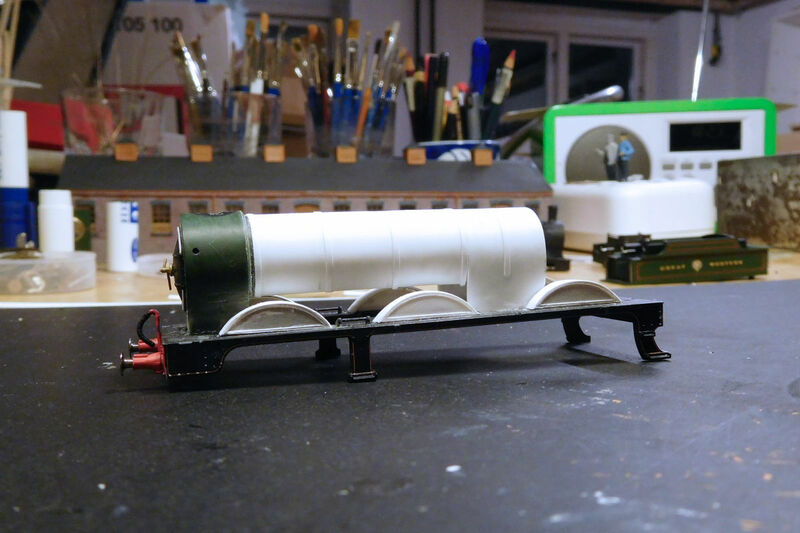 The door was then lowered to appropriate height by carving out the lower part of the smokebox, and filling out the space above with plastic putty. 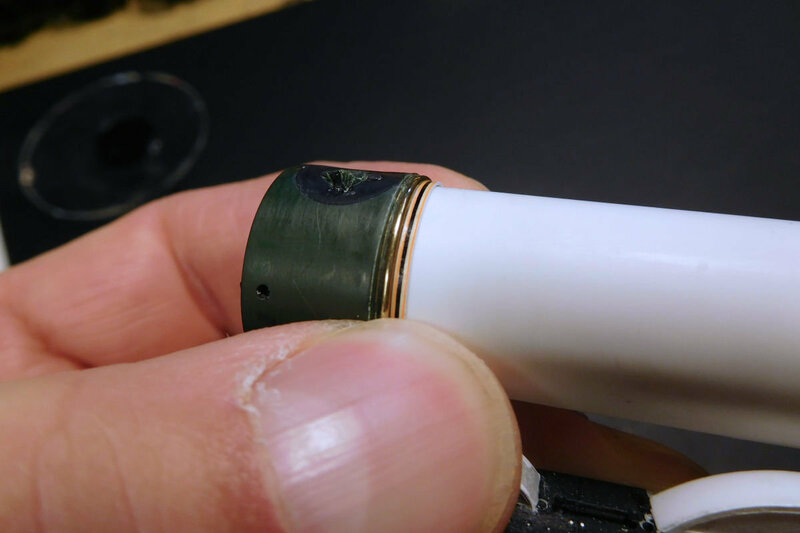 The cylinder cover was filed back and will be replaced with a “piano lid” type cover later. The replacement splashers were made from 5 and 10 thou styrene, cut on my Silhouette, and reinforced on the inside with additional layers. I initially attempted to replicate the slight overhang of the splasher tops that can just be made out on the prototype. 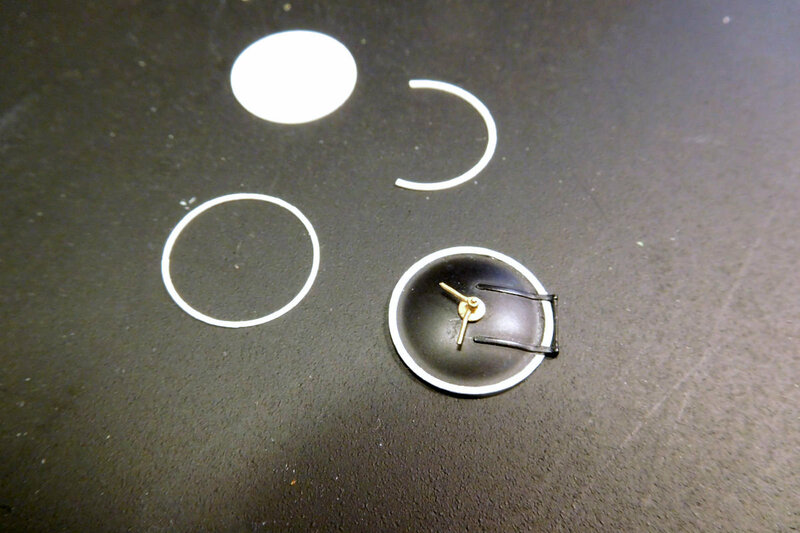 However it became too prominent in styrene, and was easily damaged, so I left it off. I made the splashers 20 x 5 x 4 mms, which is overscale compared to the prototype, but about 1mm smaller in all dimensions than the Oxford originals. As this (reversed) test fit shows, there is the ample clearance over the wheel flanges and I could probably have made them smaller, but wanted to be on the safe side. The boiler bands are a compromise, and possibly a mistake. 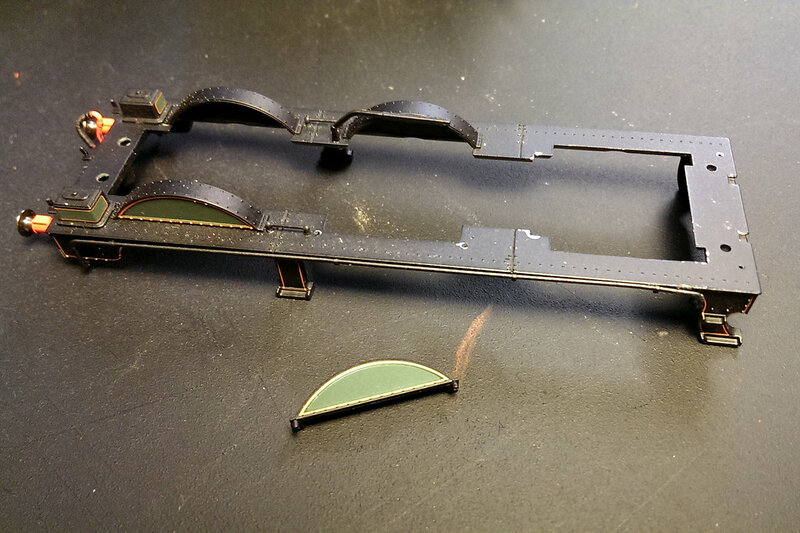 I made them from 5 thou styrene strips, and deliberately made them too wide in order to fit the HMRS lining transfers. They do look rather too prominent at the moment though, and need some work. The body fits snugly over the chassis. So far I have made virtually no modifications to the chassis, as I want to be able to replace it without too much trouble in case of a motor failure. Work has now started on the cab. The sides and front were printed on my Silhouette.